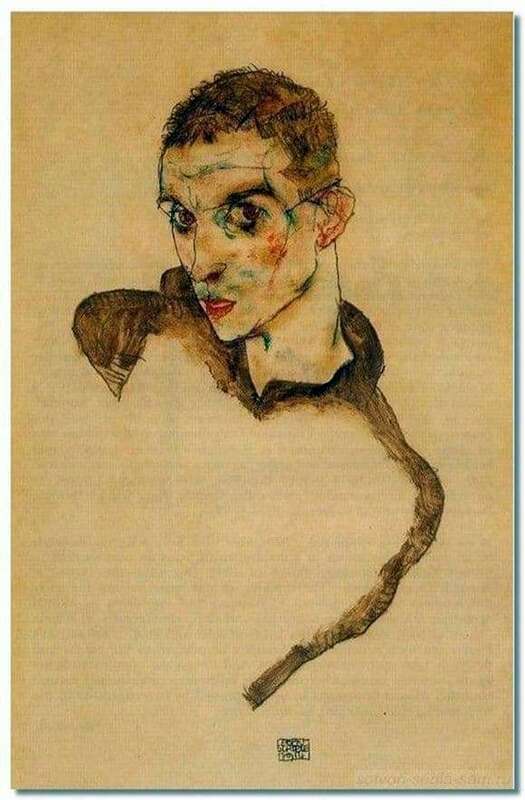 Most of the paintings belonging to the brush of Egon Schiele are dramatic and gloomy. The artist died at the age of 28, but the death shroud covered him long before his death. The painting “Love” was written in a glamorous-mythical style peculiar to the artist, which he adopted from another famous Austrian painter Gustav Klimt. The main and only character in the picture is a young man, frozen in an unnatural male position. The face of the man has a clearly expressed triangular shape, the nose is long, pointed to the bottom, the lips are large, half-open. The head is in a half turn in relation to the viewer, it seems that the person in the picture sideways observes what is happening in the room and is just about ready to leave the portrait in order to join the tied conversation. The artist paid special attention to the big bright eyes framed by not less big eyelashes. The appearance of a man is quite neat, he is dressed in a brown shirt, his hair is short-haired, but at the same time it is clear that the human body is exhausted, his face is unnaturally thin, and his eyes are unnaturally large. The complexion is pale yellow, which most of all indicates the presence of the disease. The picture was painted at the beginning of the last century, shortly before the artist’s death, because its appearance can be considered a symbolic precursor of a quick death, followed in 1918. The cause of the death of the artist was a terrible epidemic of the Spaniard, which claimed thousands of lives of people in the European continent. The victims of the Spaniard were also the wife of the artist and the unborn child. Many of the paintings, in deadly pale tones, were painted in this gloomy time for the whole world.